December 12, 2016, New Delhi: The common citizen’s rating of the demonetisation program announced on Nov 8th seems to be taking a hit as the cash crunch continues and for some negative impact on earnings persists. 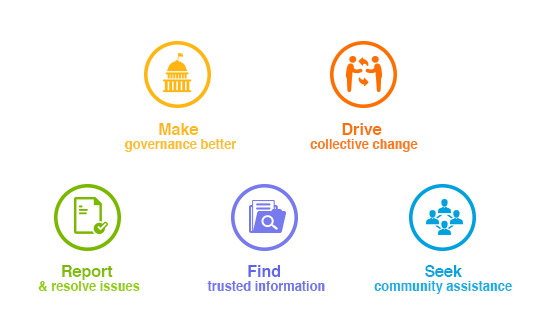 According to a survey conducted by citizen engagement platform LocalCircles in which 8,526 people participated, only 39% citizens now feel that the implementation of the program has been good. This number is a sharp fall from the 51% who supported the implementation about 3 weeks ago in a similar poll. 3 weeks ago, 25% citizens had rated the scheme as poorly implemented. This number has shot up to 36% at present, primarily due to the prevailing cash crunch and for some the negative earnings impact becoming a lasting phenomenon. 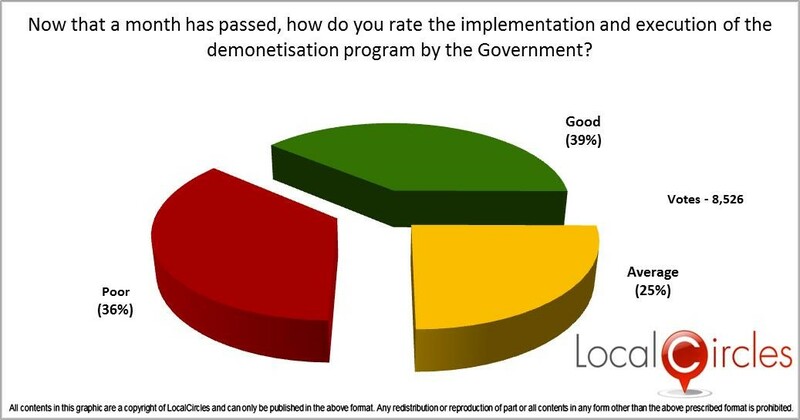 Approximately, 25% citizens have rated the demonetisation implementation as average. Although the gradual shift towards a cashless economy is being appreciated by some citizens who believe that this exercise is a much needed and transformative change, the long queues outside banks and ATMs are still causing a lot of discomfort and productivity for others. Some citizens are also seeing their earnings impacted now. Per a related LocalCircles survey, 20% citizens are seeing their earnings impacted negatively, a month after demonetisation. While currency demonetisation was a radical step, citizens believe that better planning must have been done by the Government to avoid inconveniences which should have eased by now. LocalCircles members in a recent survey during Dec 8-11 had highlighted that 61% of them were not able to find a cash dispensing ATM in their area. In addition to this, as reports by RBI and media indicate that over 12 lakh crores of demonetised currency has been deposited already with over 2 more weeks to go, citizens are questioning whether most black money would have already been laundered thereby making the whole scheme ineffective. Large stashes of new currency being found in many instances and multiple cases of bank personnel found to be involved in such collusions have also left a bad taste with people. Other members have focused on the counterfeit currency advantage and its positive impact on reducing terrorism. However, a high majority seem to be of the consensus that investigating laundering using advanced analytics is a must going forward. Going forward, citizens have suggested that added measures must be taken to minimize rush at banks and atms in the next few weeks by printing and transporting notes faster to the banks. Citizens are also saying that the government should make sure that the internal controls and ethics recommitments must be executed at banks so leakages and frauds are minimized. Citizens are also suggesting if somehow new currency seized from black money hoarders and fraudsters can be re-routed via the bank and atm network, it will help in more people finding cash.